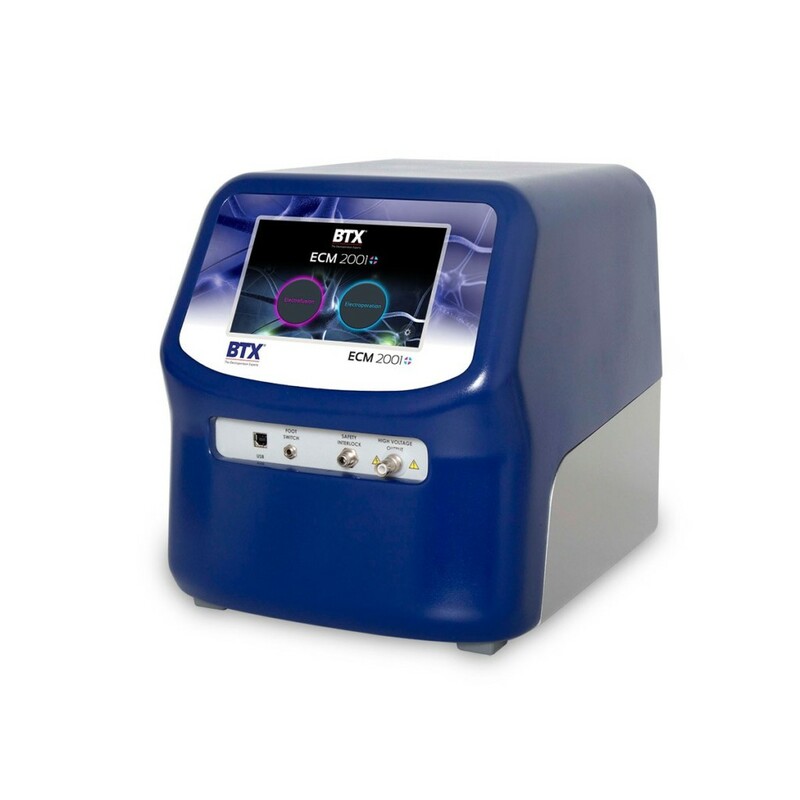 The ECM 2001+ Electrofusion and Electroporation System provides fast, efficient cell fusion in hybridoma production, hybrid cell formation and nuclear transfer applications, as well as square wave electroporation for transfecting genes and other molecules into mammalian cell lines. The ECM 2001+ is a multifunctional electrofusion and square wave electroporation generator. The ability to generate both AC and DC waves allows for fast and efficient cell fusion in hybridoma production, hybrid cell formation, and nuclear transfer applications. This system is powerful enough to yield high transfection efficiencies for cell lines and difficult to transfect cell types including stem cells and primary cells. The gentle square wave pulse also allows for high cell viability of these cell types. The ECM 2001+ is intended For Research Use Only. Not for use in diagnostic, pre-clinical, or clinical procedures. AC sine wave aligns cells by dielectrophoresis for electrofusion applications. Square DC waveform provides the fusion pulse for electrofusion or is utilized in mammalian electroporation applications. Fast, efficient cell fusion in hybridoma production, hybrid cell formation and nuclear transfer applications are facilitated by the combination of AC sine wave and DC square wave pulses. Fusion is achieved by the generation of an AC current sine waveform that generates a benign dielectrophoretic alignment of cells. Next, a DC square waveform is applied to promote fusion between aligned cells. After fusion, the AC sine waveform is reapplied maintaining the cell compression for the rounding off process resulting in a higher number of hybrids. Electroporation is a standard method used to transfect mammalian cell lines to express recombinant human proteins which are used for therapeutic purposes. Gene delivery by this method is typically used in transient transfections to study protein expression or to temporarily knockout or “silence” these genes using siRNA. This is used to study gene targeting and function. Square waveform electroporation is an efficient non-viral method for transfecting genes and other molecules into mammalian cell lines. This technology is commonly used to study gene targeting, function and to understand protein regulation. Alternatively, adding additional selection steps to isolate stably transfected cells allows for ;integration of a gene into the genome of the cell for long term expression of protein. The use of the ECM 2001+ offers the control needed to adjust electrical settings for optimization of parameters. This system is powerful enough to yield high transfection efficiencies for cell lines and difficult to transfect cell types including stem cells and primary cells. The gentle square wave pulse also allows for high cell viability of these cell types.